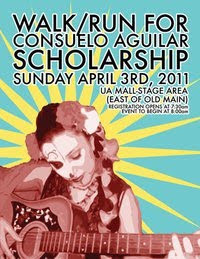 As a community, Tucson is readying to take part in a scholarship run/walk for Consuelo Aguilar on April 3, 2011. It’s purpose: to bring about cancer awareness to our community. When she passed on to spirit world in Feb. 2009, she was the heart and soul of our community, an integral part of Raza Studies, both at the K-12 level and at the University of Arizona. She was also at the heart of defending Raza Studies and fighting for the dignity of all human beings. To raise cancer awareness was her last wish. But the story about why we are running for her goes back several years. Two summers ago, as a community, several hundred of us gathered at 5am in front of the Tucson Unified School District headquarters. From there, we walked across the city to Joaquin Murrieta Park, then about 50-60 of us ran from Tucson to Phoenix in 115-degree heat. We did it in an incredibly hostile environment – not the desert, but the political climate – in defense of Ethnic Studies. That run, led by three ceremonial staffs, was powerful and transformative. One of the staffs, is dedicated to Consuelo. The day we arrived at the capital, we won, though the sponsor of the anti-Ethnic Studies bill vowed to kill Ethnic Studies the following year. While we were able to jump in and out of support vehicles, we had the knowledge that it is the same desert that over the past several years has claimed thousands of migrants attempting to cross the border. Since that summer, we have come to understand the moral power of running. This we’ve done as a community under siege; we are often in court for students whose families are being separated by the migra. For those of us that aren’t being deported, we seem to be welcome to stay… as long as we shed our culture, history, language and identity. The purpose of the runs is to uplift the physical and spiritual health of our communities. That is why as a community, we are now running for Consuelo. Her mother notes that Consuelo would be very pleased about the run because Artemisa’s side of the family is Tarahumara, with a proud tradition of running. Why do we run? Because we abhor injustice, but love humanity. "I walk with the community in Tuxson because they walk together. I take little steps and big steps depending on the need. I pause if they decide it's best for me to do so. I have paused. I began walking with them because Consuelo invited me to do so. She knew I owned a machete called words, music, revolutionary spirit. Our community saw and continues to see dark times. The obstacles we face are constant. It's night time and we can barely see the heavy bushes called obstacles. There, in the path hardly paved at night when one can hardly see anything, Consuelo would ask me to swing the machete. She was rebellious in that way. She would ask questions, because that is what leaders do...they listen. She would ask if I was tired. I would say, yes, but let's keep going. She was capable of seeing the future because she was clear. She loved high points because at the not too far distance, she could see dignity not too far ahead. She saw the future. We were all tired of swinging and couldn't see much. Her resilience was the indicator that she could see the future and our reason for continuing to walk together. Today, her spirit guides our steps. Remember she can see the future much more clear now, she is relentless. She is waiting for us to get there. She is waiting because she knows we walk together. She is young, radiant, relentless, but I want her to rest now. We need to get there faster because we now that not too far ahead is dignity and we she is certain that it's there...We want her to rest, we want dignity...sling your machetes out, speed up the pace ... and let's run together"